What can be more delightful than seeing children joyfully enter their respective school premises at 7 am, unmindful of the inhospitable weather conditions prevailing in their regions? Yes, more and more children in parts of Dharwad and Gadag districts of Northern Karnataka are now beginning to eagerly make their way to school every day, braving heavy rains and cold winter mornings on some days and sweltering heat on others, thanks to the Skill in Village programme. Learning to speak and write in English is a great challenge to these students from the rural belt. For many, it is a dream. However, thanks to the programme, this dream is now becoming a reality for several of these children from the region. It is a well known fact that the number of children from rural areas who can communicate in English confidently is relatively much smaller when compared to the number of such children from urban areas. Shivanand, one of the guest at the graduation ceremony of SiV addressing the gathering on the importance of education and its effects in building the rural India. The Skill in Village initiative was formulated by the Deshpande Foundation in July 2017 with the vision of empowering every child in the immediate rural ecosystem by making them future thinkers, leaders and doers. The SiV model has been designed using proven techniques and research and caters to sixth to ninth grade students studying in government schools. The two-hour classes begin at 7 and go on until 9 in the morning and begin at 5.30 and end at 6.30 in the evening on six days a week. The classes are divided according to students’ grades. The programme is for a period of 10 months and is currently on in 12 centres. The current centres are located at Ballarwada, Arishinagodi, Tirlapura, Srirkola, Hebbala, Khanapura, Hirekoppa, Vasana, Kurugovinakoppa and Ibrahimpura villages in Dharwad and Gadag districts. With 11 well trained teachers and 3 cluster heads, the program this year proved beneficial to 650 students. The SiV program focuses on enhancing the creativity, competency and listening, speaking, reading & writing skills (LSRW) of the enrolled students. In the academic year 2019, SiV is looking forward to reach out to over 6,000 students through a 100 centres. “With well designed content curated by industry experts, periodical comprehensive teacher training, systematic student and teacher assessments, technology integration and evaluation & monitoring at regular intervals, this program can yield better results year by year. 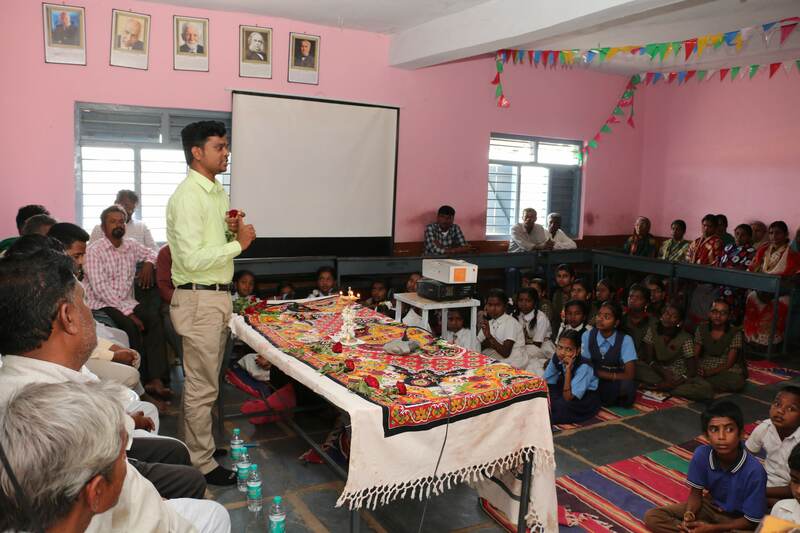 Providing a platform for skill development at the right age can do wonders and it has the power to eradicate poverty, hope for development and better scope for self empowerment,” says Harish M H, Program Manager, Skill in Village. The 2018-2019 batch in three centres – Hallikeri, Hirekoppa and Hebbala — recently completed their program and had their graduation ceremony. The graduation ceremony for the remaining 9 centres is to take place before the end of this month. The time spent by the SiV team with the students during the last six to seven months has helped them develop a wonderful bond with the students. In fact, wherever the program has been held, the entire village has been very supportive. Due to the love of the villagers and their demand for the initiative, it has become a huge success. It is now being scaled up to benefit 6000 students in the coming academic year. Nagamma Herappa M, a teacher of SiV, says, “For the last three months, I have been teaching students at the Habbal centre. I feel so happy for having come to this village and for having taken up this job. How many people can claim to have the joy of being loved by children and the entire village, be provided complete protection and care by the villagers and to top it all, get paid for the job? To be frank, I rarely miss my hometown these days. 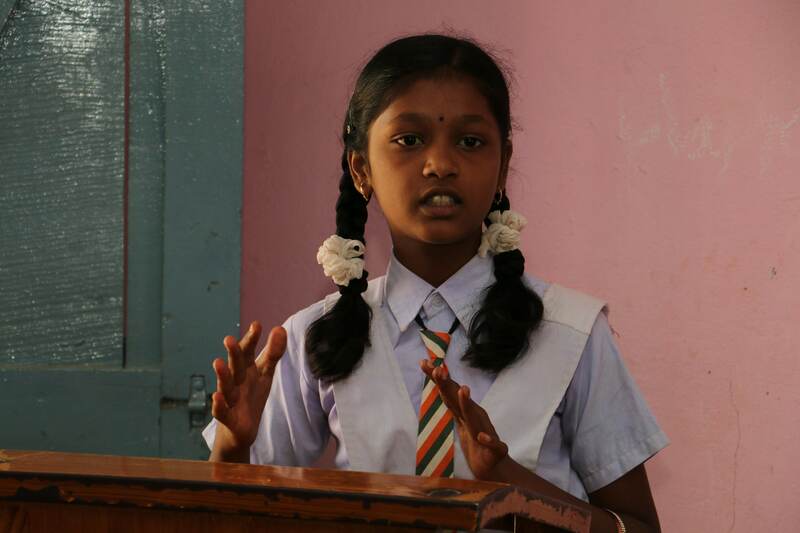 A student of SiV sharing her SiV journey during the graduation ceremony at Hirekoppa School of Gadag district. Like Manjunath, many students have begun to realize their dream and are beginning to believe that they have a bright future ahead. They can be future leaders, thinkers and doers without doubt. Their confidence and communication skills together can help them do great things. This is how SiV is trying to develop the mindset of rural India.